Should I Buy iPhone 7 and iPhone 7 Plus or Not? Gone are those days when people used to carry heavy phones as there style statement and making phone calls where a treat. Then came the time when everyone played with those tic-tac buttoned phone which was a easy to use phone. Flipping phones are still one of the most loved phones but in this high tech world the touch which changes your life matters. Now, people are less concern about the voice they hear on phone but the point of their concern is do they have a phone which has bite in apple logo behind it? 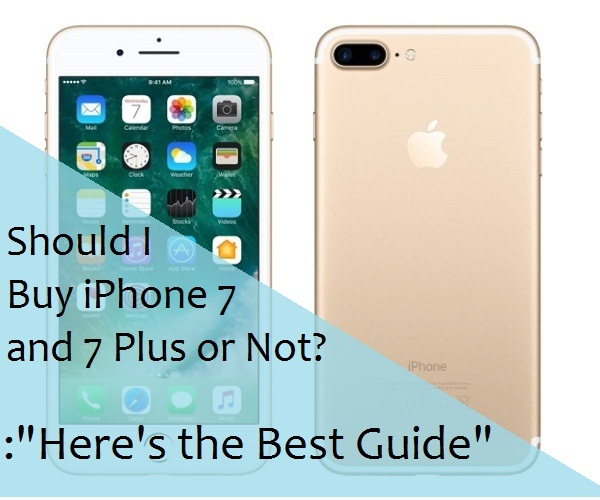 So, here we introduce to you Apple iPhone 7 and iPhone 7 plus with all its mind-boggling features which will make your decision easier to buy it or do not not! Apple iPhone’s camera is one of its kind no other phone camera can replace it. With iphone 7 and iphone 7 plus they proved their niche again with 12MP camera ,Optical image stabilization ,7MP Face Time HD camera and Quad-LED True Tone flash, your shooting experience will be way more beautiful than you expected. Shoot anywhere, everywhere and at anytime 24*7 as four led will give you much vibrant photos in the dark. The holiday you went on-Photos will you give the exact feeling like you are there, iPhone 7 with its wide colour gamut and 25% brighter function will revive all your feelings like it all is happening in front of you. And less spoken about, its 3D Touch will respond instantly to you in every subtle touch you do. Exclusively iPhone 7 and iPhone 7 plus is coming with stero speaker system which allows you to enjoy your music twice the iPhone 6s sound. And with its most conservation earpods with lightning connector makes heart beat, beats musically. You can surf, bath while listening music with your iPhone 7 and iPhone 7 plus. What else you can ask for from iphone? When you gizmo will be with you every second. Apple iPhone has geared up with introducing iPhone 7 and iPhone 7 plus in five rich shades. Each shade is unique in itself but iPhone jet black is making its seamless style statement by itself. With so many competitors coming up with new designs to look beautiful, apple iphone 7 and iphone 7 plus still stick to its old design. So, nothing you can be excited about. Where samsung is stepping up with new safety features, iPhone 7 and iPhone 7 plus customers still has to wait for an eon. Worst of all no ear phone jack which lead iPhone 7 and iPhone 7 plus users drilling their phone to get one after watching a false viral video. Though we all know love for apple iPhone is immortal, and every good thing has some disadvantageous. So selecting iPhone 7 or iPhone 7 plus will a little confusing decision to be made. But we can vouch on if you have iPhone or iPhone 7 plus all eyes will be on you as they are new gimmicks for sure.